Crabgrass is one of the peskiest summer weeds that affect this area. Crabgrass is usually a light green color with spike-like branches. Crabgrass begins its germination process when the soil temperature is between 55-60 degrees for a consecutive 5-10 days. One of the best ways of treating crabgrass is in the early spring with the use of pre-emergence. This product prevents the crabgrass from emerging by altering its germination process. If crabgrass does emerge in the summer, different herbicides (weed controls) can be used to kill this weed. Nutsedge, also known as water grass or nutgrass, is probably the most noticeable and most annoying summer weeds. It typically stands as a single lime green or yellow stalk with 3 blades and grows rapidly, exceeding the height of the grass. Nutsedge is very unsightly because it is so noticeable and treatment can be difficult, especially if the lawn has been freshly mowed. The treatment of nutsedge can be difficult because the root system is of a tubular nature, meaning multiple tubes, tunneling within the soil. 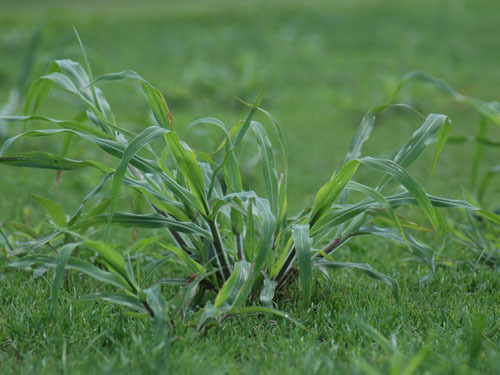 So although nutsedge may only be present within a spot or two of the lawn, the tubes or tunnels may be present and growing throughout the entire lawn. Spurge, also called spotted spurge or prostrate spurge, is another common weed that presents itself in the summer months. Spurge has a round stem that is often covered in fine hairs; this stem may turn a red color when growing in sunny areas. Spurge likes open areas to grow such as bare lawns and cracks in sidewalks or driveways. This pesky weed typically presents itself between May and October each year. To sum it up, weeds need room to grow. Having a thick and healthy lawn will nudge these weeds out of your lawn. Mow at a higher setting during the summer months and be sure you are on the proper fertilization and weed control regime as recommended for your area. Just as quickly as the seasons changed to sprout these pesky weeds, they will change again to take them away.